Safeside Chimney and Duct Cleaning is a full service chimney and duct company. (HIC License # 0631371) All of our service technicians are fully trained to take care of any and all of your particular needs. Safeside Chimney promises customer satisfaction. Should any questions arise before or after the job you may contact any member of our management team who are assembled to serve you. Always use a certified chimney sweep. Safeside employs 10 CSIA Certified Chimney sweeps who receive year round education and hands-on training, both in-house, and through Chimney Safety Institute recommended vendors. To learn and utilize all chimney and venting safety practices and techniques that are promoted by CSIA. To render my services in an honest and fair manner and to refrain from engaging in unfair or deceptive practices or making any unfair or deceptive statements including but not limited to with regard to use of the CSIA logos. To comply with all applicable building codes in the areas I service, with the manufacturer’s installation instructions for the products I install, and with recognized chimney and venting practices. To promote and educate consumers about safe chimney and venting practices. To strive to continually update my knowledge, skills, and technique with regard to currently accepted chimney and venting safety practices. To conduct myself in a decent, respectful, and professional manner when serving in my capacity as a CSIA Certified Chimney Sweep or CSIA Certified Dryer Exhaust Technician, or when attending a function or event of an organization in the chimney or hearth products industry. To comply with the proper usage of all CSIA Registered Trademarks as defined in the CSIA Trademark Use Guidelines documents. I agree to accept and abide by the CSIA Code of Ethics as a standard in rendering services as a CSIA Certified Chimney Sweep or CSIA Certified Dryer Exhaust Technician. By agreeing to this Code of Ethics, I understand that it is my responsibility to remain abreast of any changes to the Code of Ethics, that my actions may be reviewed by a committee of my peers, and that failure to abide by these ethical obligations is a violation of CSIA policy and, in accordance with the CSIA Code of Ethics Violation Procedure, may result in disciplinary action by the CSIA or its delegated committee. I agree to hold harmless CSIA and its committees from any and all liability resulting from any disciplinary action taken against me. We are also fully licensed and insured. We are an accredited business of the Better Business Bureau and The National Chimney Sweep Guild; and as members of those organizations, we subscribe to the principles and services of each. Over the years, Safeside Chimney has serviced thousands of satisfied customers on an annual basis. Safeside Chimney currently services approximately 5000 + homes a year. Safeside Chimney employs 20+ talented individuals whose variety of skills are focused to serve you , our clients. We at Safeside Chimney pride ourself on happy customers. A happy customer is a yearly customer for life and we would like you to be one of our lifelong customers. Safeside Chimney GUARANTEES if for any reason, you are not fully satisfied with the services performed on your home, we will re-service those areas at no extra charge to you. Our office is open from 8AM to 8PM for customer assistance and we invite you to call today with any questions. 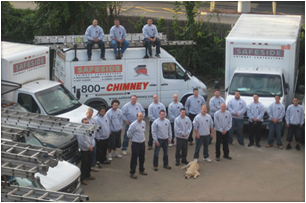 As a Leading Chimney Service Company in Connecticut, we belong to many member associations and have multiple affiliate vendor Memberships. Below is a list of our more prominent associations & memberships.